I first stumbled across Mark Skorji’s photos while searching for supercub pictures. 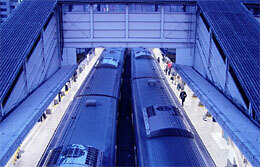 I followed a link from his website to the photos he has on TrekEarth and was blown away. I like to look at them every now and again. They are really inspiring! This is a new design with an old concept. 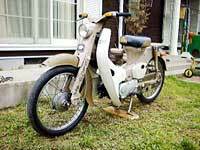 Based on the Supercub (49cc), this is part of Honda’s “N Project”. Click here to read the entire press release from Honda. It’s pretty cool because you can customize some parts and colors when you order it, to mix ‘n match to make your own style. I think you should get one Kusunoki-san! 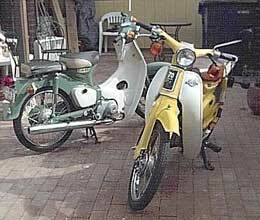 Today I got an email from a lady here in Austin saying that she had a 1980 Honda C70 for sale. I went over there to take a look, and it wasn’t in very good shape, but the price was right for a fixer-upper. The frame looked good, and it has most of the parts. Plus, her husband delivered it to my house in his truck. I am a little apprehensive about fixing it up, but it should be fun. There are lots of parts available for this model, and since I have no timeline other than a couple years, I can afford to wait to find good deals on parts. I will have plenty to do to fix her up cosmetically (sanding, painting). 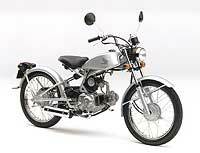 I was about ready to buy a 1962 Honda C50, but at the last minute I am cancelling that (I feel kind of bad because the person who I was buying it from is really nice and was going to help with the shipping). 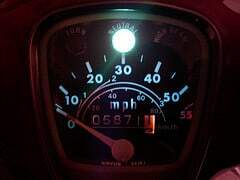 I have started a page to track my Supercub project here. An old obsession of mine is back! 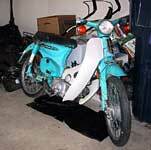 When I was in Japan, I fell in love with the Honda Super Cub. There were a lot of cool variants, for instance, the Press Cub (for newspaper delivery). These motorbikes are so uncool that they are supercool. 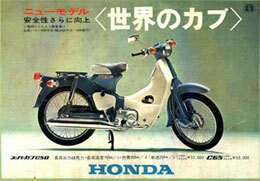 Here’s a link to the Honda website in Japan that has the super cubs. Here in the States, they are hard to find and expensive. I am hoping to get lucky and run across one in the classifieds. If you know of one for sale (cheap) in Austin, let me know!